One of my favorite things about summer is being able to cook outdoors. It’s hard to cook outdoors in the city so I take full advantage of it whenever I head home to NJ on weekends. This past weekend was father’s day weekend and my dad wanted to go camping. When we go camping my dad always goes all out with cast iron cooking. 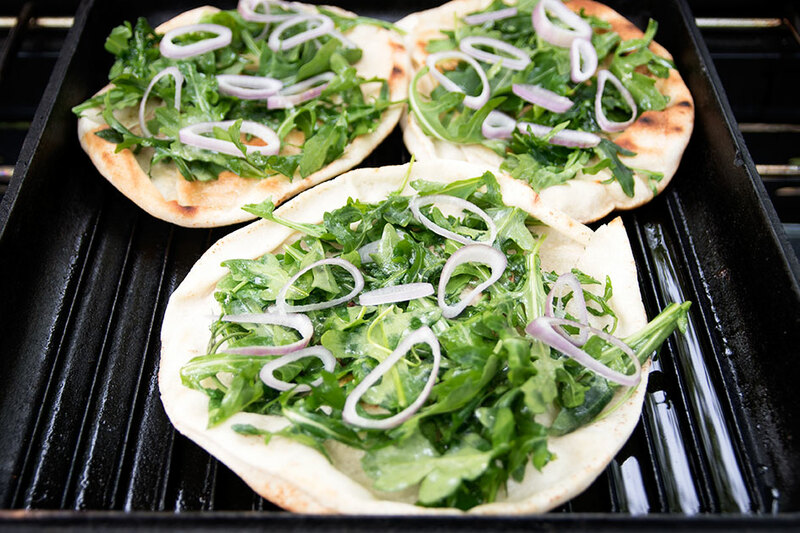 This time around we set up a stove top and used a cast iron griddle to make these tasty flatbreads. It was the perfect snack for in between lunch and dinner. 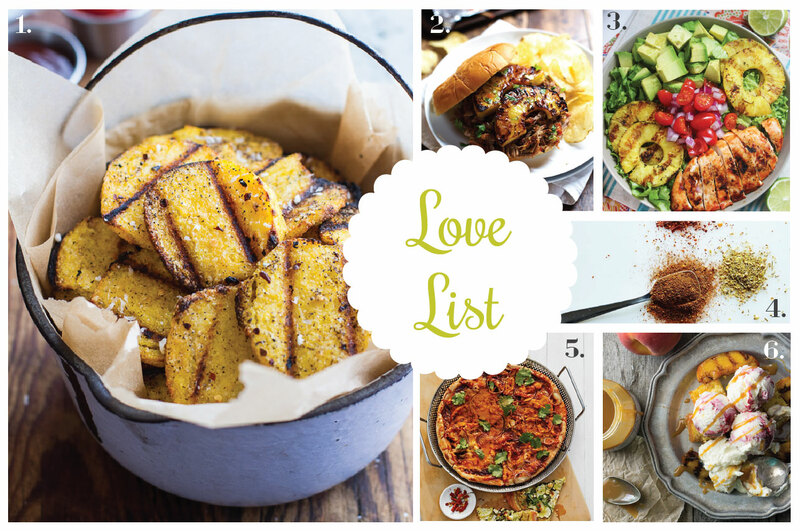 They are also simple to make, all you need is a grill or grill top and a handful of ingredients. 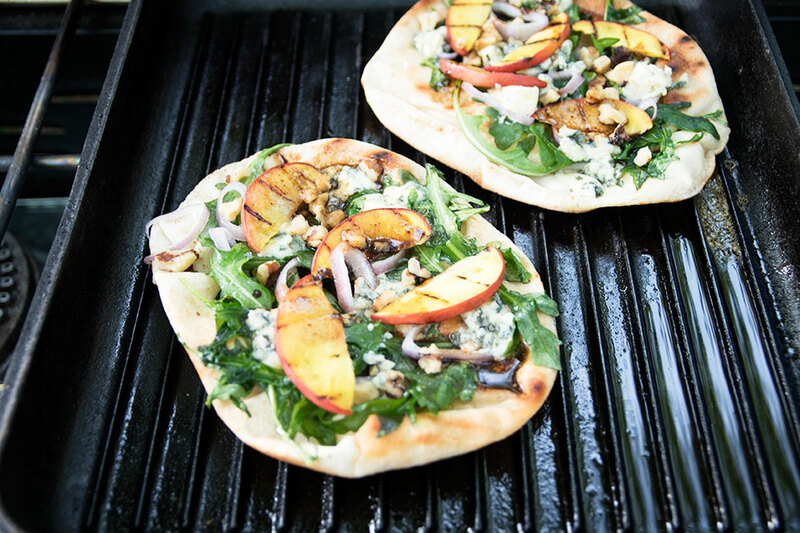 We used pita bread as the base and toasted it on the grill top to give it a little crunch. 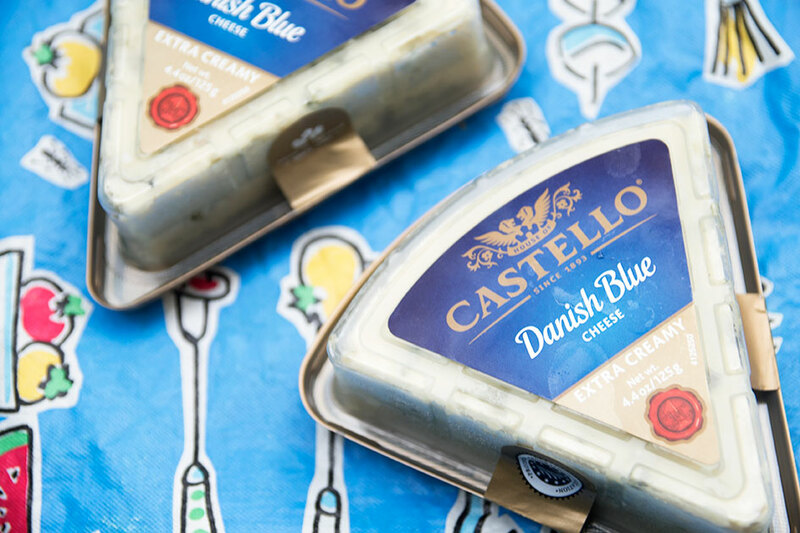 I absolutely love cheeses with distinct flavors so I chose to use Castello’s extra creamy Danish Blue. 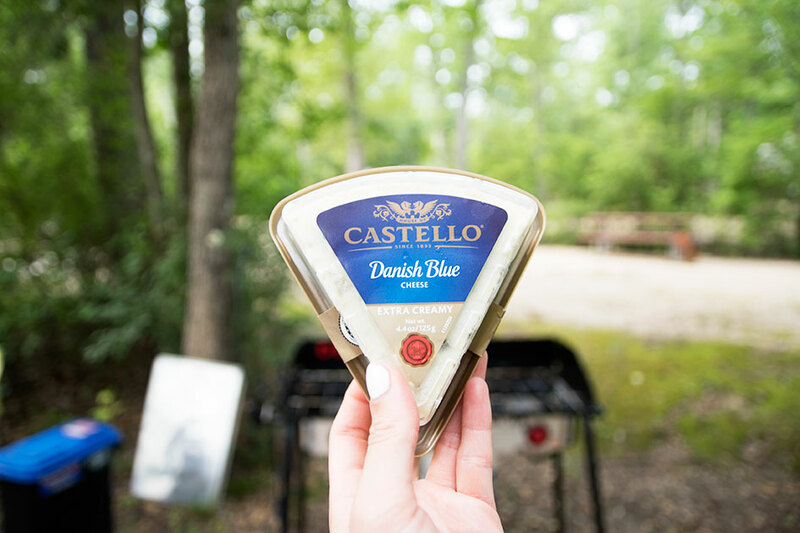 I like the consistency of this cheese because it gets fairly soft and the flavor has just the right amount of strength. 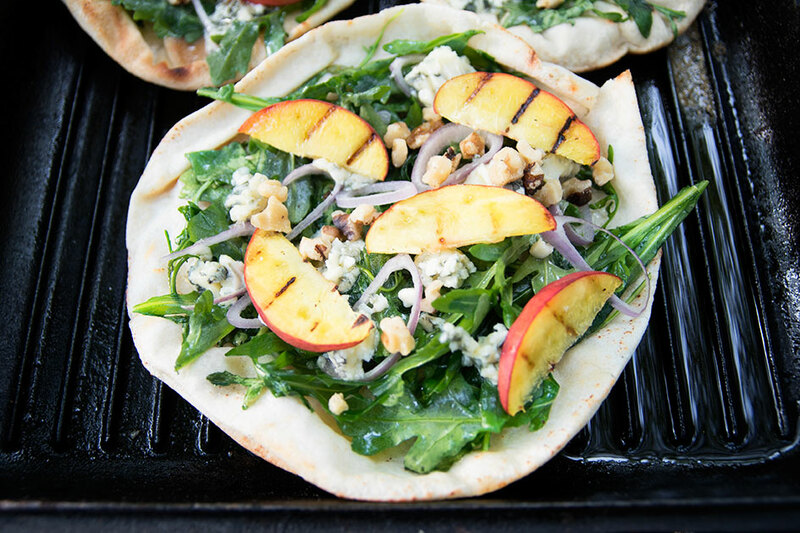 I then chose ingredients that paired well with blue cheese: arugula, grilled peaches, sliced shallots, walnuts, and a drizzle of balsamic fig vinegar. The juicy peaches were great for the warm weather and paired nicely with the Castello cheese. 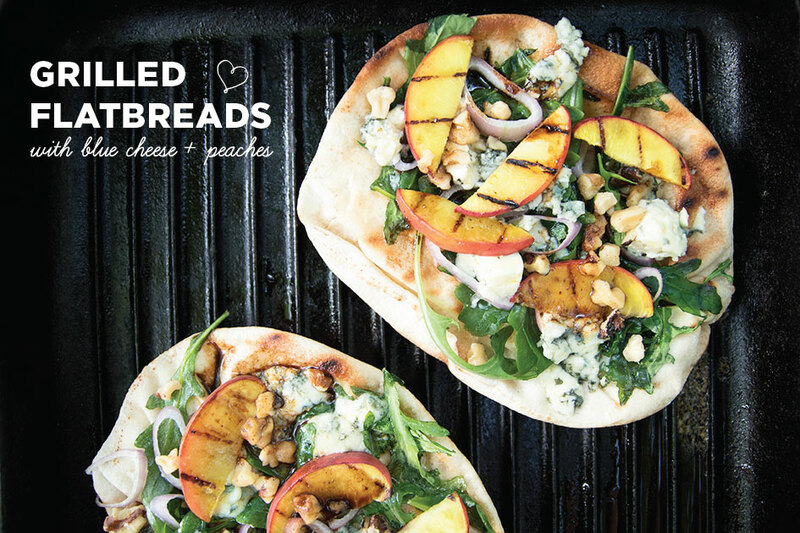 If you want to give these flatbreads a try then check out the recipe below! 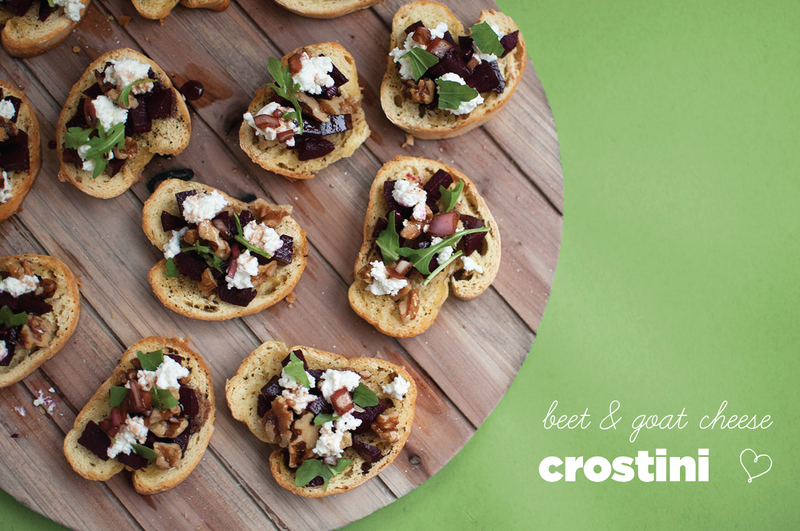 For additional fun recipes using blue cheese check search for #BluesdayTuesday on Instagram, Facebook, or Twitter! 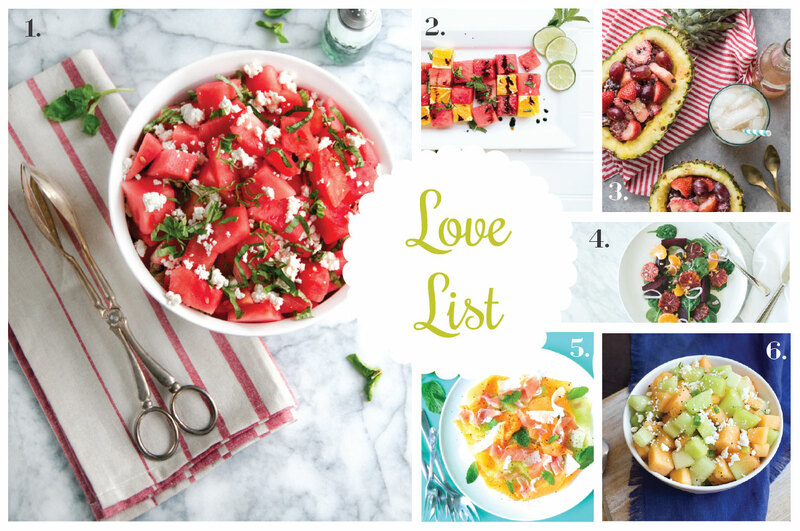 What toppings would you use? 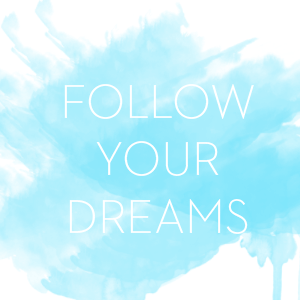 *Post sponsored by Castello cheese, all opinions are my own. 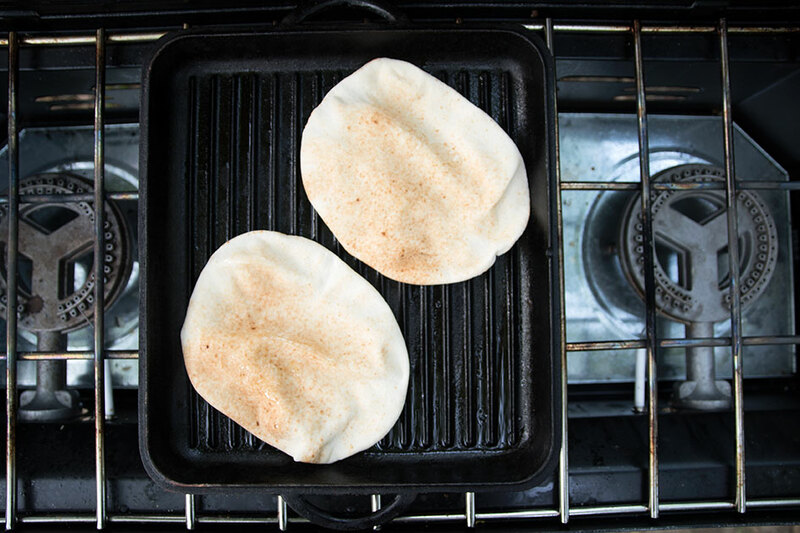 Spread 1 tablespoon of olive oil on the fronts and backs of the pita bread. 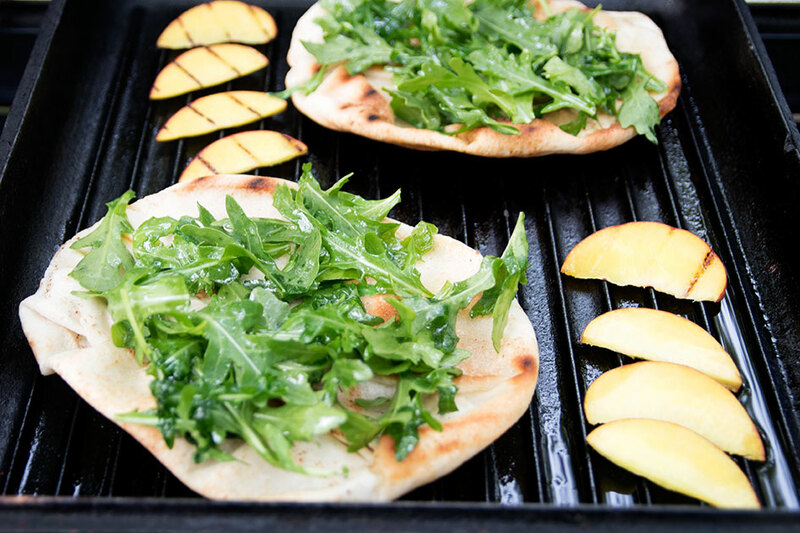 Place the pita bread on the grill top. 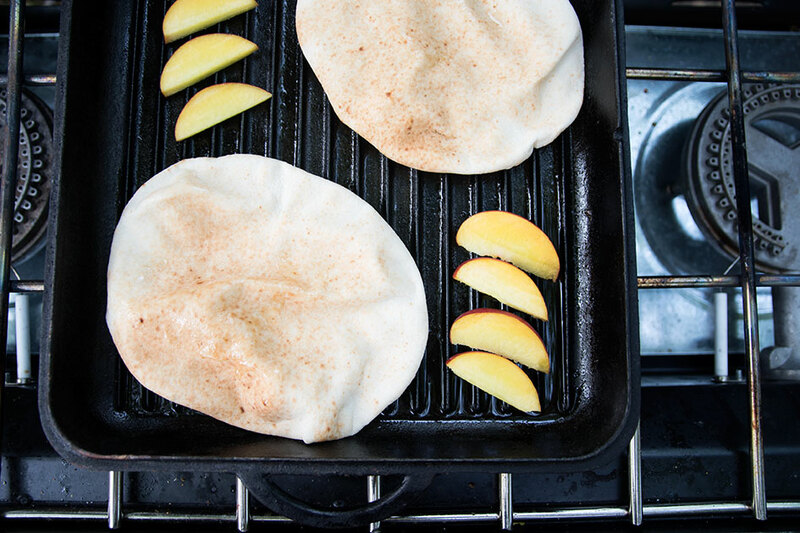 Flip each pita after 2-3 minutes. 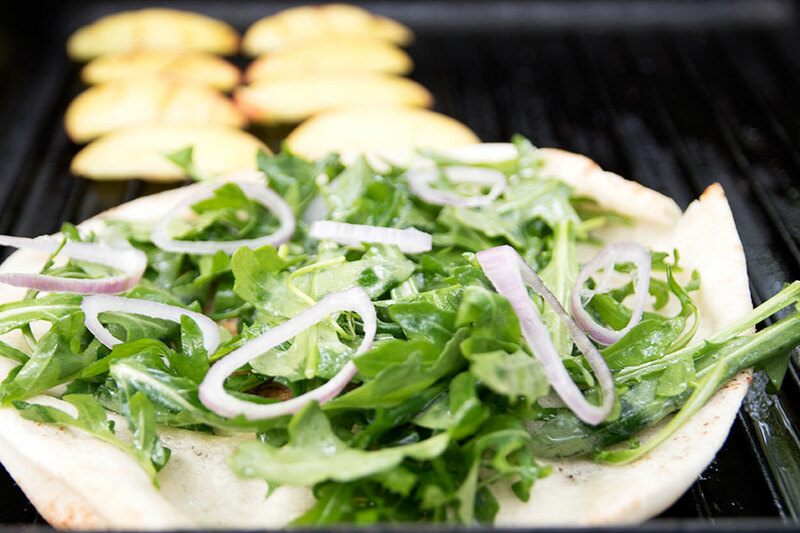 Top each pita with a handful of arugula. 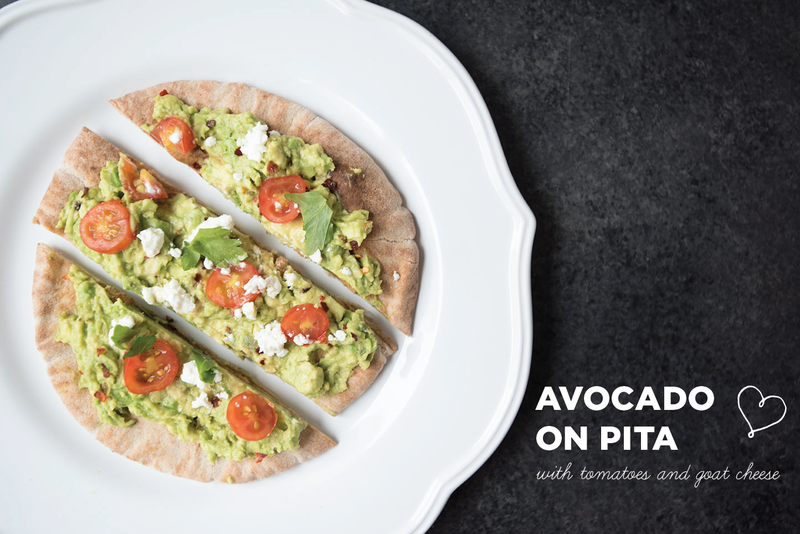 Top each pita with sliced shallots. 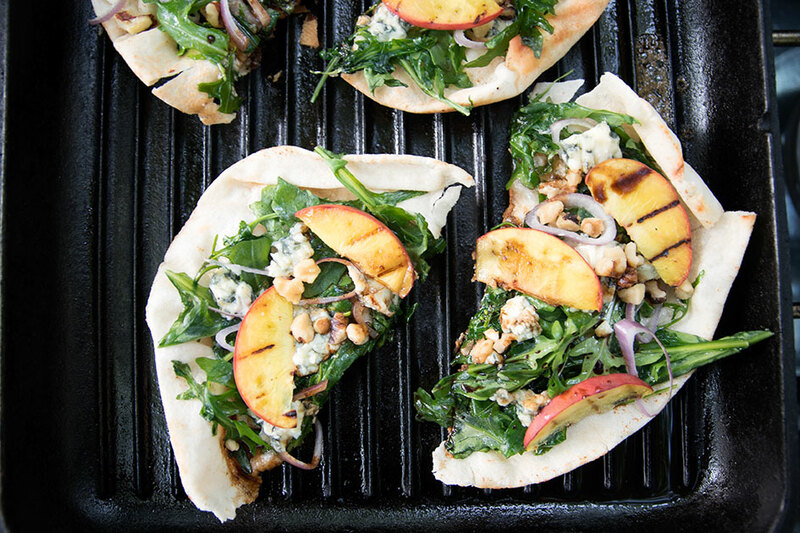 Crumble the blue cheese onto each of the pitas. 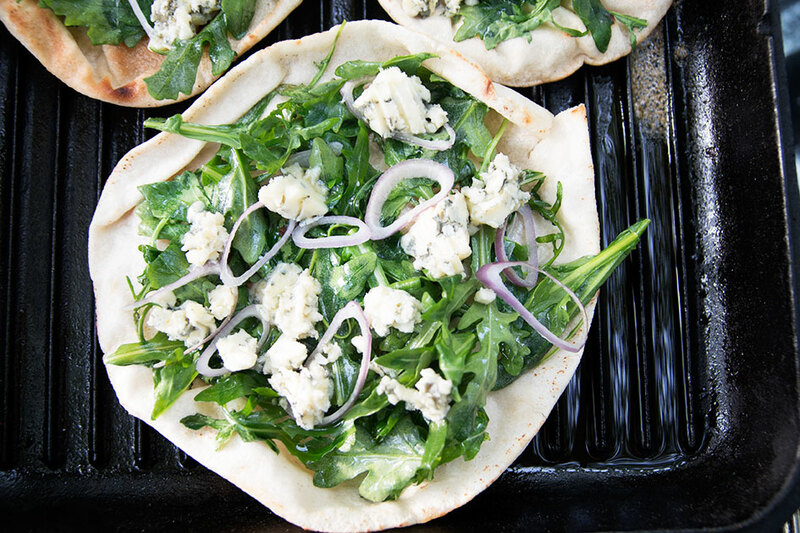 Let pitas cook on low heat for 1-2 minutes or until the blue cheese starts to melt. 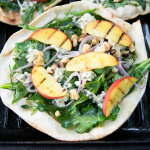 Add walnuts and drizzle each pita with balsamic vinegar. I chose to use balsamic fig vinegar for extra flavor however, any balsamic vinegar is fine.